I have really enjoyed sharing photos of our house with you as I continue to decorate it. 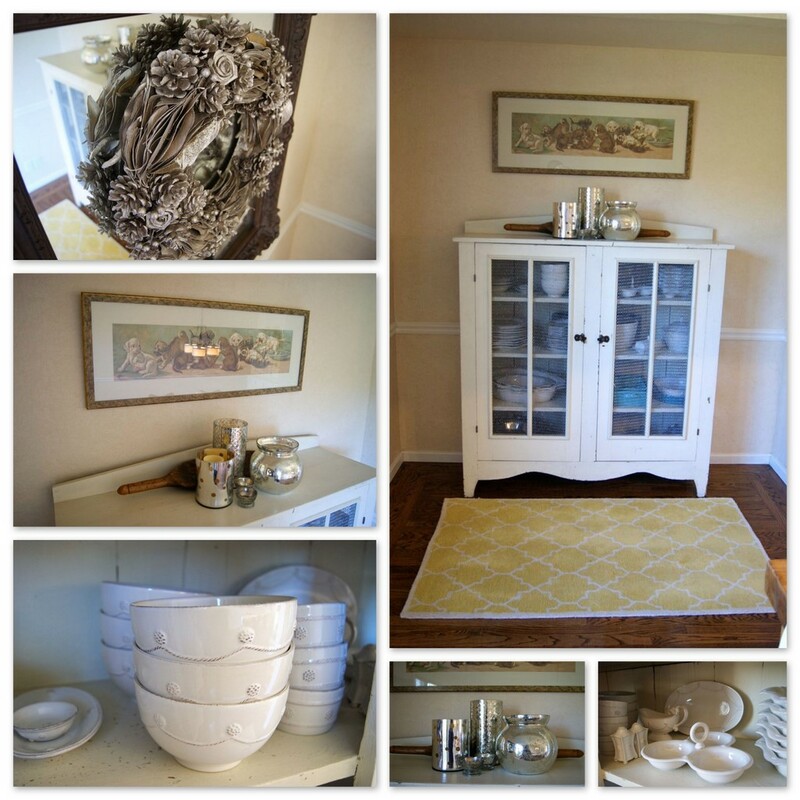 Last month I shared our guest room and today I am going to give you a tour of our dining room. 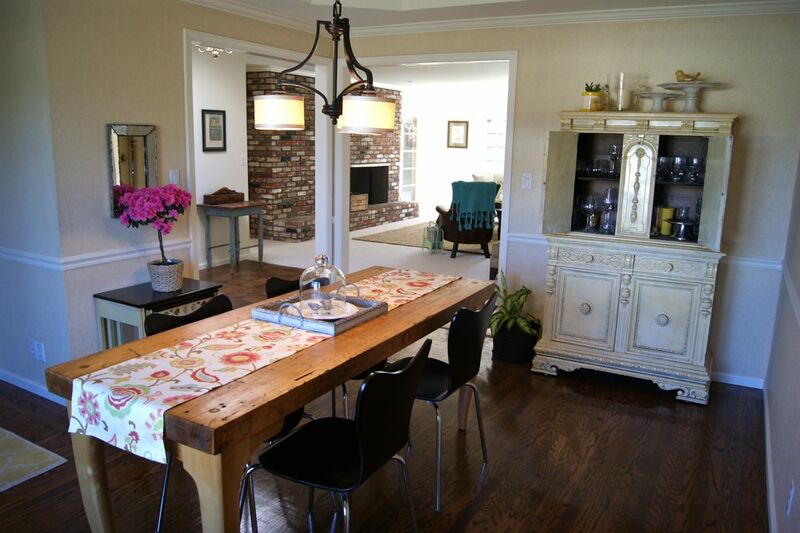 Our house has a beautiful dining room full of light and open to the rest of the house. It used to be a bedroom but our landlord converted it to a dining room when he added the master suite to the back of the house ten years ago. I love all of the furniture in this room because each piece has an interesting story behind it. The white hutch in the right corner came out of my Grandma Orr’s basement. It was in one of her store rooms for as long as I can remember. It has so much charm and detail and was tickled to have it. She gave it to me when moved into my first apartment at the start of law school and it has been with me ever since. It is on the one thing that I would run back into my house for if there was an emergency, who knows how I would get it out but I would try! Depending on where we have lived it has held either our yellow fiesta dishes or our white Juliska china. Right now I have our white dishes inside and they look simple and rustic. The top is decorated with mercury glass candle holders that look pretty at night when they are all lit up. 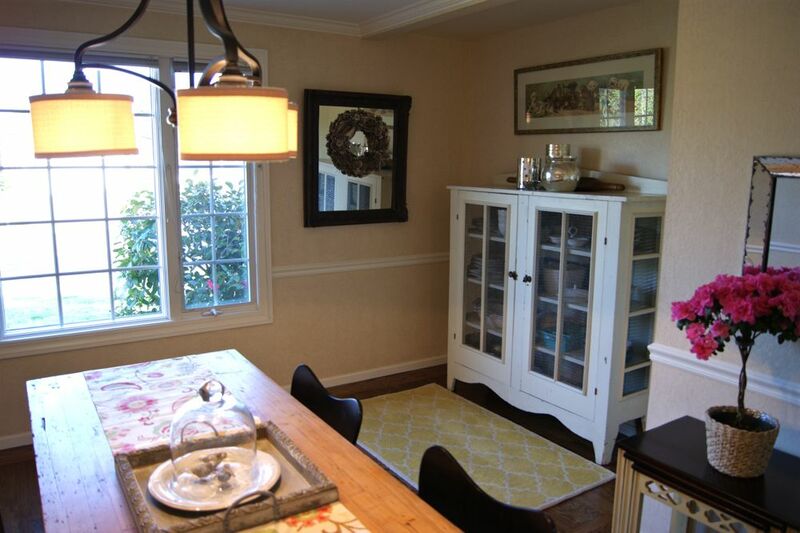 Above the hutch is a vintage “by the yard” print of puppies. My mom gave it to me as a gift and I had it reframed. In the corner near the hutch is a dark brown frame that a crazy hoarder gave me when I worked in Chicago. It was originally just a gold frame and my mom painted it and put a mirror in it for me. Right now I have a silver wreath suctioned to it, it is technically a Christmas wreath but I like to keep it up all year round. Who says glitter needs to be seasonal? Ha! Looks pretty cute! I bought a new rug for our living room (we are in the process of decorating that room right now) so I moved the little yellow rug into the dining room. 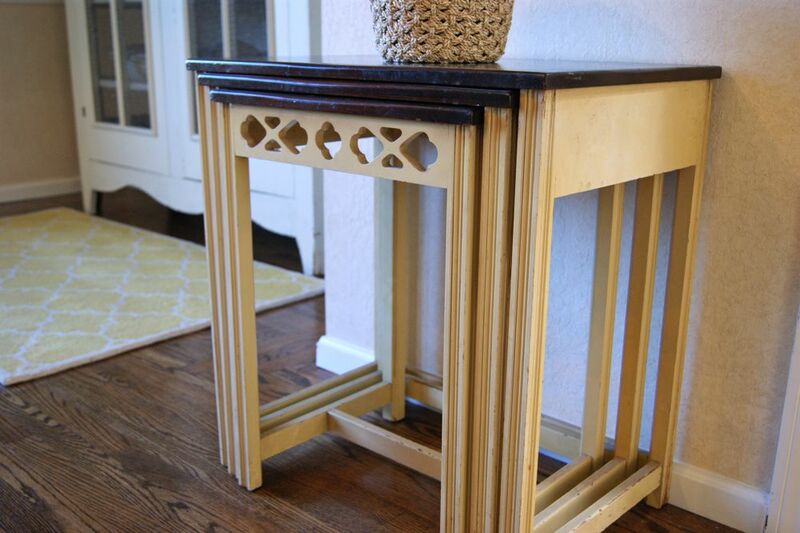 It is small but it really ads a pop of color and mirrors the detail of the nesting tables. Next to the hutch is a set of nesting tables that I found in my friend Michael’s shop in Chicago. They were in the window and I fell in love with them instantly. He had them priced at $350 but over time (and many other purchases from him) he decided to sell them to me for $100. I love the color combination and the charm. 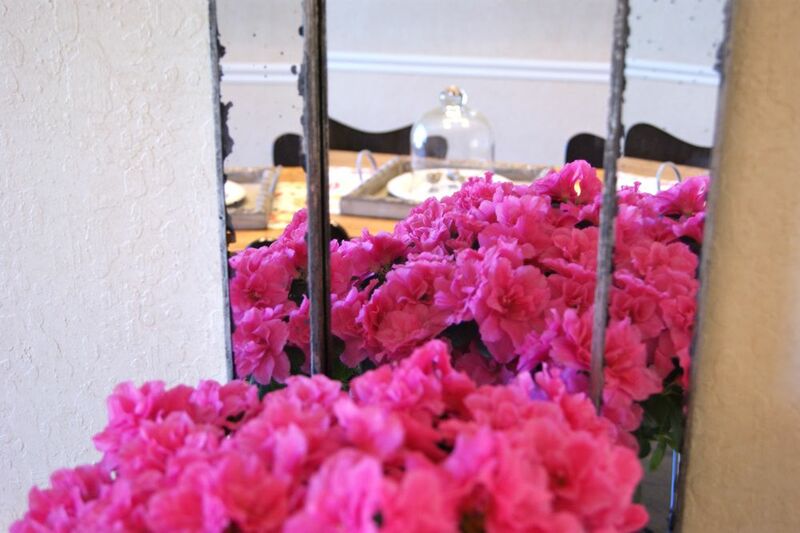 I like to put seasonal accents on the table to spruce it up, right now I have a pink azalea topiary that my friend Nancy gave me for my birthday. I love the reflection in the mirror (not an antique, just a bargain find at TJ Maxx. This room has beautiful crown molding and a cute chair rail, it was painted a light yellow when we moved in and we haven’t changed it. The one thing we did change is the light fixture. I asked my landlord for permission to switch out the dated brass fixture that he had hanging and thankfully he said yes. Chris and his dad installed a new one for me last year it made a huge difference. The yellow hutch in the right corner was the first piece of furniture that Chris and I purchased together. We found it at Michael’s shop in Chicago, it was missing the shelves and the back but we saw potential. Michael fixed it up for it us and we love it. It was painted yellow when we bought it and I don’t think I would ever change it. Right now it holds all of our entertaining supplies and glassware. It has great detail and I love every inch of it. Our dining table is a bit small for the room but who cares! I saw something similar at a high end furniture shop in Chicago and it was WAY out of our budget. I loved it so much I asked my friend Michael if he could make me something similar. He had several pieces of butcher block that he had hanging around his shop so we spent an afternoon finding the perfect piece and finding legs for it. I love the final result, the butcher block is so thick and the legs are such a great match. At one time I had 2 chairs and a bench at the table but I ended up selling them on Craigslist and buying these chairs from West Elm. 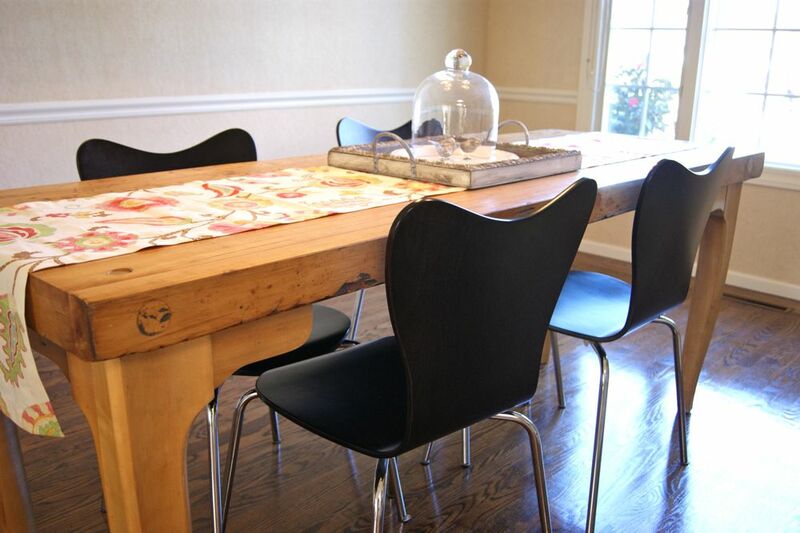 They are modern and simple and they let the table be the star of the show. For spring I have this pretty runner on the table with a tray that my parents sent me for my birthday as a center piece. 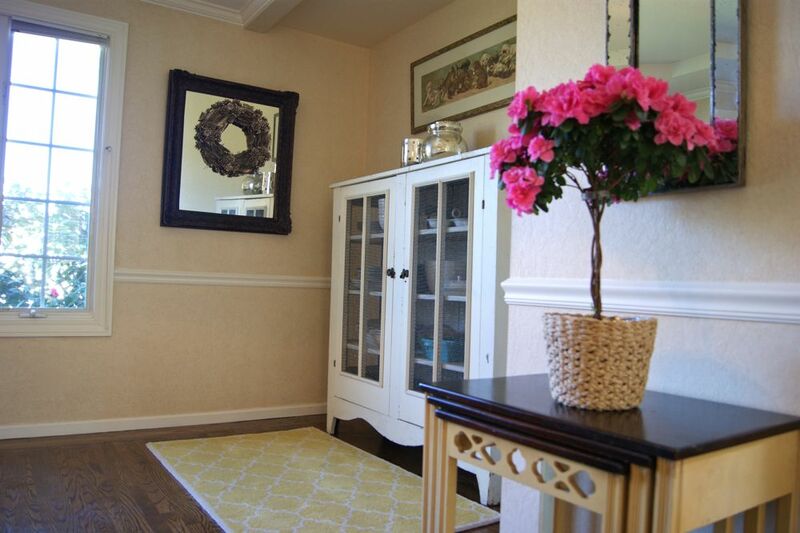 The colors in the runner tie in with the rest of the room and the the adjoining rooms. I have to keep it simple just in case I need to use the table for a take home organizing project. On the tray I have these 3 little chicks. 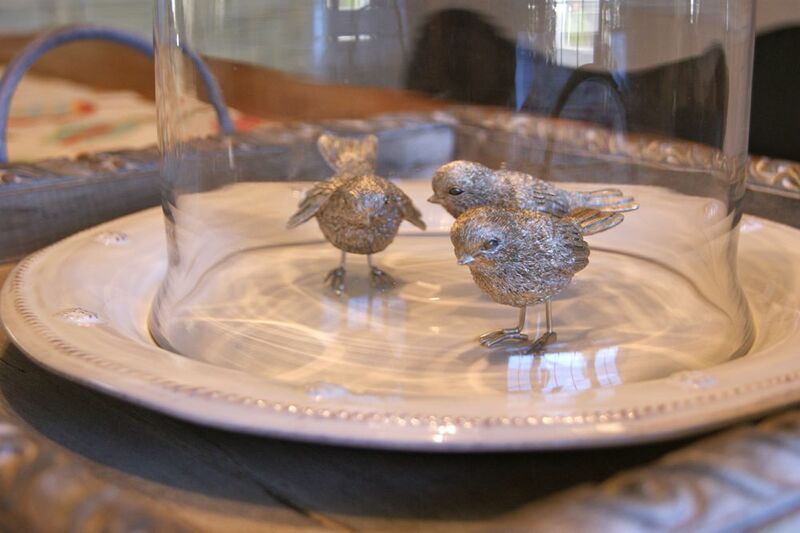 I love birds and this trio is perfect for Spring! 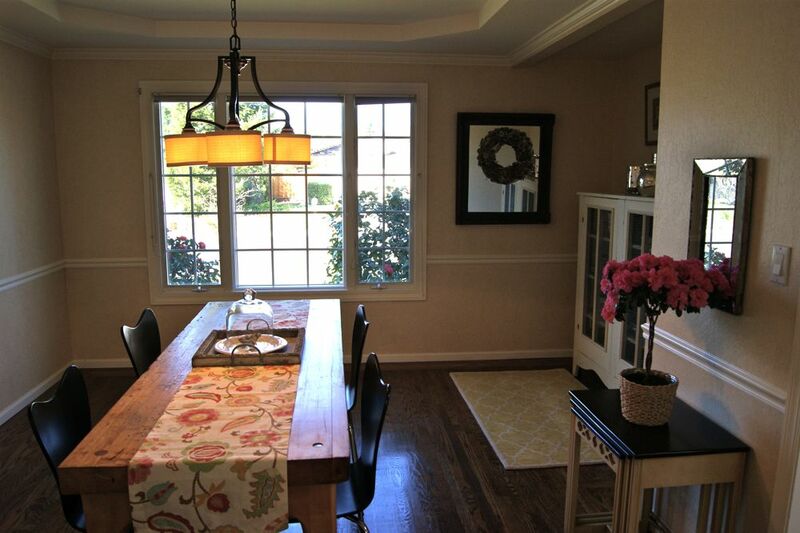 We have a nice big window in the dining room that faces the front of the house and lets in a ton of light. It is nice to eat dinner and watch people and pooches walking and running by. 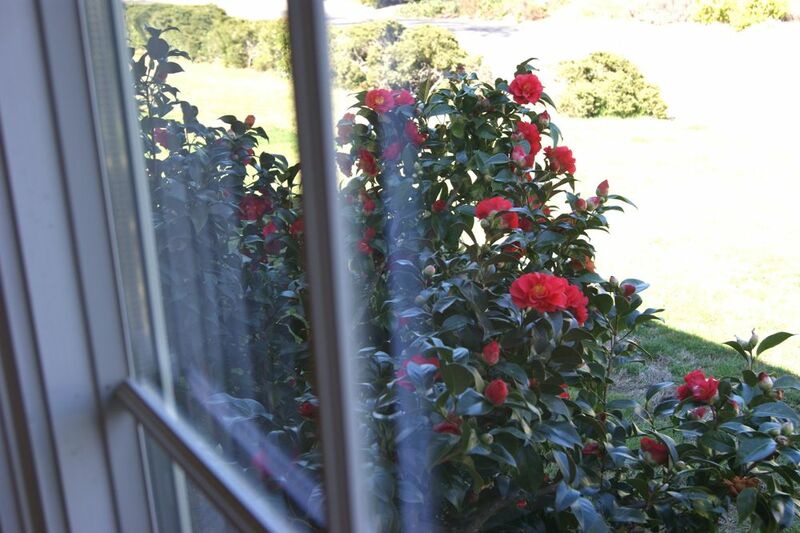 Outside the dining windows are 3 large camellia bushes that are flowering right now. Reading this reminded me of when you got the bench for the table and we somehow got it to fit in the back of my hatchback!!! Ha, I totally forgot that we did that! Didn't I have to ride facing the back holding on to the bench so that it wouldn't fall out? That furniture store was fun, I wonder if it is still open? Where did you buy that runner? I bought it at a little shop in Lake Tahoe, the tag on it says “Ballard” so maybe you could find it online. They had lots of stuff to match it. 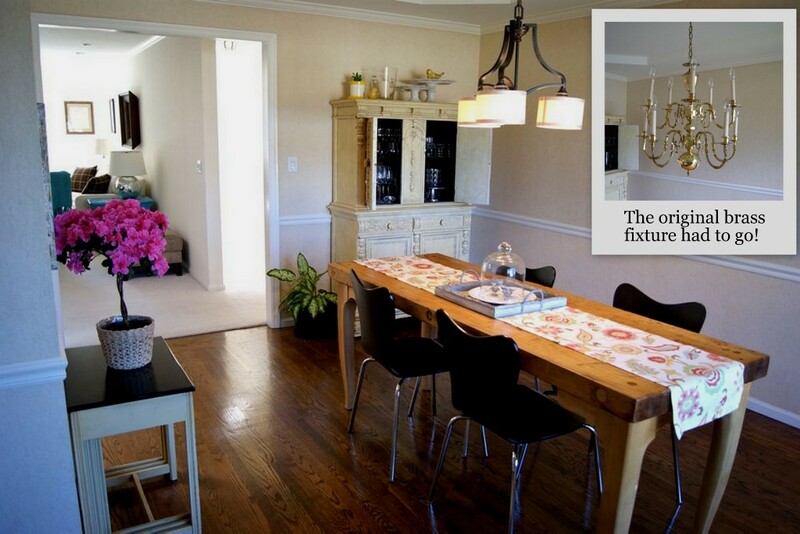 I think it is so nice that each piece in your dining room has a story/memory that goes along with it. I love the way you've put this room together! It's so warm and inviting. Love it! Your dining room is very pretty! 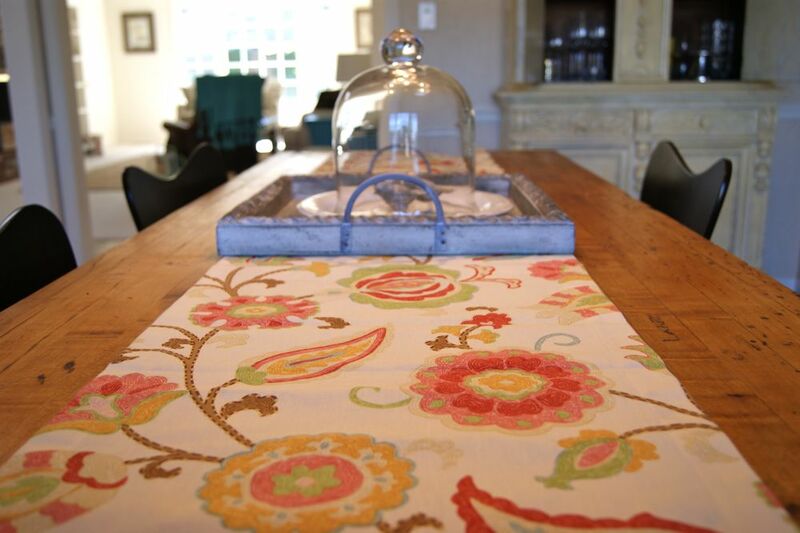 The table runner is a lovely pop of colour and the little birds under the cloche are cute. The china cabinet is a great piece too. 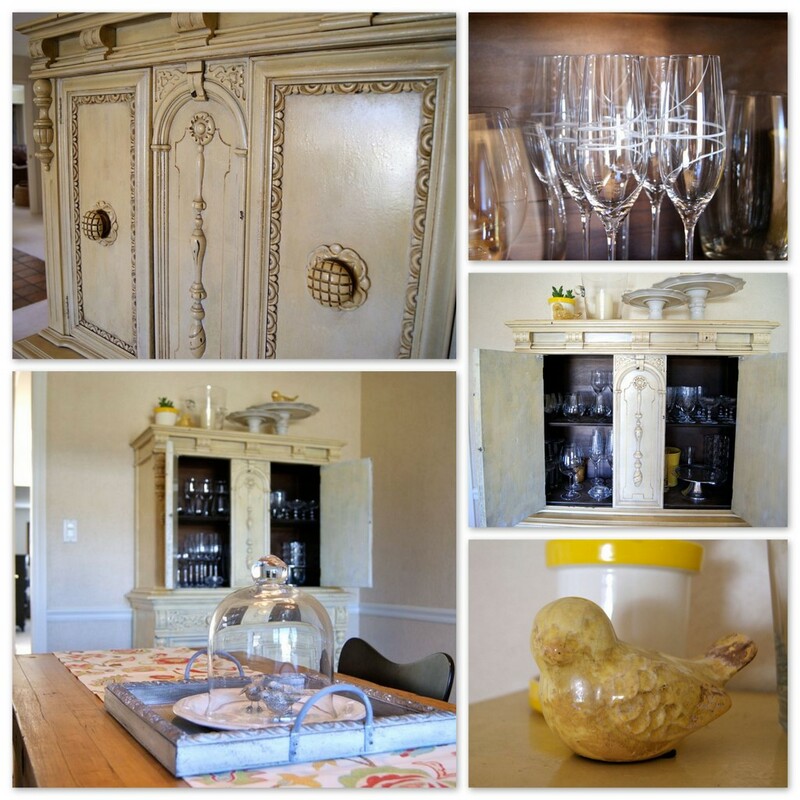 I'm stopping by from French Country Cottage's Feathered Nest Friday.